As a family, you will spend a lot of time in the car. Our children are our most precious cargo when on the road, and steps have to be taken to ensure their safety. And one of the best ways to keep your child safe is to make sure they are properly seated in a child safety seat. It’s a known fact that child safety seats can reduce fatal injury significantly in babies and toddlers. Unfortunately, many accidents involving children in car seats are due to either incorrect installation or positioning the child incorrectly. Here are several Child Car Seat Safety Tips to help ensure your children are safe while on the road. Choose the right car seat for your child. First of all make sure you are buying the correct car seat for your child’s age, height and weight. Buying the incorrect car seat for your child can have horrible consequences. Try the seat out in the store before you take it home. Place your child in it and adjust the straps and buckles to make sure it works for your child. Get your child safety seat checked out. Always get the child safety seat inspected. When leaving the hospital with a newborn, many hospitals offer a free car seat check to make sure it is correctly installed. And did you know that many police and fire stations offer a free car seat check, too? Visit one of your local departments and make sure to ask for a certified child passenger safety technician. Always read both your vehicle’s and the car seat owner manual instructions thoroughly, and make sure you install the seat correctly. Where you place the safety seat can make all the difference. Rule number one: never, ever place a child safety seat in the front seat of the car. In the backseat, place the seat where it works best whether this is in the middle or to one side or the other. Put the belt through the correct slot, and check to see that it holds the seat tightly in place. If your safety seat can be used facing either way, make sure you are using the correct belt slots for each direction. And speaking of which way the seat is facing, infants should always ride facing the rear until they’re at least age 2 or for as long as possible (they reach the weight or height limits of the seat). 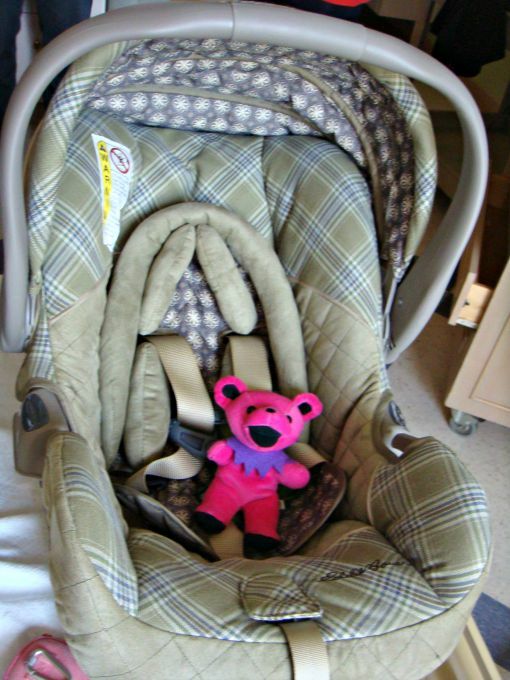 Infants who weigh more than the seat requirements before they are 1 year of age should ride in a restraint approved for higher rear-facing weights. How you position your child in the car seat is important as well. Make sure your child is securely buckled in their child safety seat. Again, read your seat’s manual. In general, the harness should be tightened until you can only slip one finger underneath the straps at your child’s chest. Place the chest clip in the proper positions as well (this will vary with the type of car seat you are using). Finally, make sure to keep your infant in a rear-facing seat for as long as possible, and keep any older children in a booster seat for as long as possible. As your child grows he or she will eventually need a new car safety seat. Look on the car seat label to make sure your child is still within the weight, height and age limits for your current seat. Once they surpass those requirements, it’s time for a new one. Remember, don’t be in a hurry to put your toddler into a booster seat; you should hold off until your child is at least too tall for their current car seat. Keeping our children safe in the car is vital, but how well you take care of your car matter as well. Be sure to always keep your car in top working condition by performing routine maintenance checks with a service professional like those at Lustine Chrysler, Dodge, Jeep, RAM. This includes everything from the tires to the windshield wipers. And remember, drive safe!